LOS ANGELES- March 7, 2018 – Profiles in History is proud to announce its historic auction will commence. 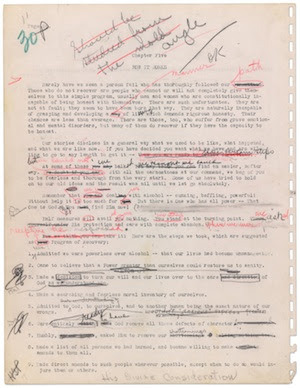 The original typed working manuscript for The Big Book of Alcoholics Anonymous is back on the auction block. It will be going under the hammer on May 5th in Los Angeles. A.A.W.S. 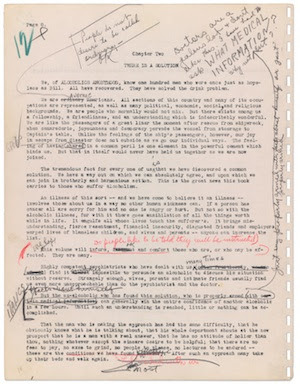 irrevocably waives and surrenders any and all rights or claims it has or may have to possession, ownership of, or title to the 1939 “Printer’s Copy” also known as the “original working draft” manuscript of Alcoholics Anonymous (the “Manuscript”), based upon a certain 1979 letter from Barry Leach or otherwise and that Roberts has the right to transfer, auction, or otherwise sell the Manuscript at his sole discretion without being subject to any claim or encumbrance by A.A.W.S. The 161 typed pages are filled with hand written edits by the founders, some by William Griffith Wilson, aka, Bill W. It belonged to Lois Wilson, Bill’s widow. It is one of the best selling books of all time, over 30 million copies have been sold since 1939. It has been translated into 43 languages. The Library of Congress ranks it the number one non-fiction book that shaped America. It is estimated to sell for $2,000,000 – $3,000,000.